...I speak for those that cannot speak for themselves. Dude! Seriously, what in the mortal Hell is wrong with your NECKPART? 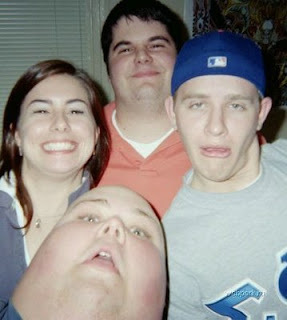 It looks like someone's THUMB has a face. If there is some explanation for this, I would appreciate being let in on it. I received this unlabeled with no caption. WTF? ok, yeah, the neck thing is a tad bit odd. but check out EVERYONE'S eyes in that pic. A bit odd? It looks like someone has a FACE on the top of their thigh. Come on, that is the strangest thing I saw on the web that day. It creeped me out. could be the new poster for saying no to drugs. 'cuz obviously they didn't. "look, drugs make you have no neck"